As the most dreaded fighter plane of the world at the beginning of the second World War the Bf 109 was overtaken by the Focke – Wulfs 190 and later versions of the RAFs Spifire at war admission of the USA. The planned successor, the Me 209 and Me 309 were bothered by development problems and the Bf 109 was further produced as a result of it at a time, as her, already out of order had put must be. Later models were equipped with larger, more powerful engines which improved the speed. The plus, however, was paid for to speed with a minus to maneuvering ability since it reduced the agility and was the additional weight particularly at starts and landings to fly the machine more difficult. The Bf 109G, was built in a larger quantity than all other 109s and was the first for this one with the stronger Daimler Benzlate DB 605A engine was equipped with a turbocharger to obtain better results in large altitudes. A these versions’, the Bf 109G-6 could contain various “arming sentences”, what meant that she could carry different substitute tanks, bomb mounts and Bewaffnungen to adapt to different tactical situations. The Bf 109G-6 could as well be equipped with the MW 50 methanol water injection system. This system brought 4 per cent the performance about normal and a switch was activating in the cockpit to inject the methanol water mixture of a tank behind the pilot seat over tubes into the turbocharger for some minutes. After this had happened, the pilot had to wait up to the next injection for at least five minutes. Although the MW 50 system of the machine gave a large speed thrust, it used up fuel rapidly anyway and the range therefore reduced. Further novelty was the MK 108 cannon (30 mm), the G-6 models with usually the MG 151 which shot by the propeller axis but shortages meant at this terrible weapon this for cannon (20 mm) were equipped. 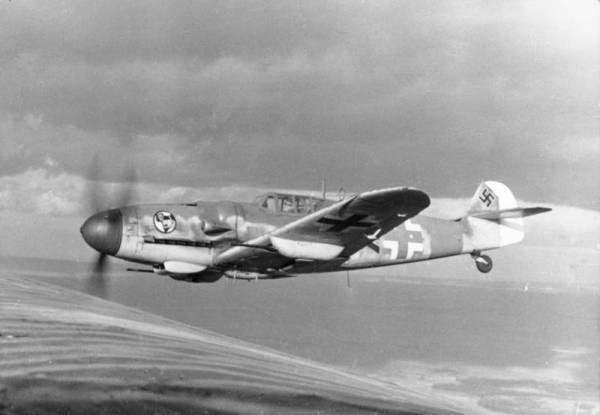 The extra weapon helped the Bf 109 to get it, to become a fatal threat for the bombers, the increase of weight, however, hindered the Bf 109 during the fights with the allied Mustangs and Thunderbolts. The Messerschmitt Bf 109 with total production of 35.000 was the most built aircraft type of the history. Empty 5,893 lbs., Max Takeoff 6,945 lbs. Wing Span: 32ft. 6.5in; Length: 29ft. 7in; Height: 11ft. 2in.